Last week, Tom sprayed the collars that had bermuda contamination in various stages. 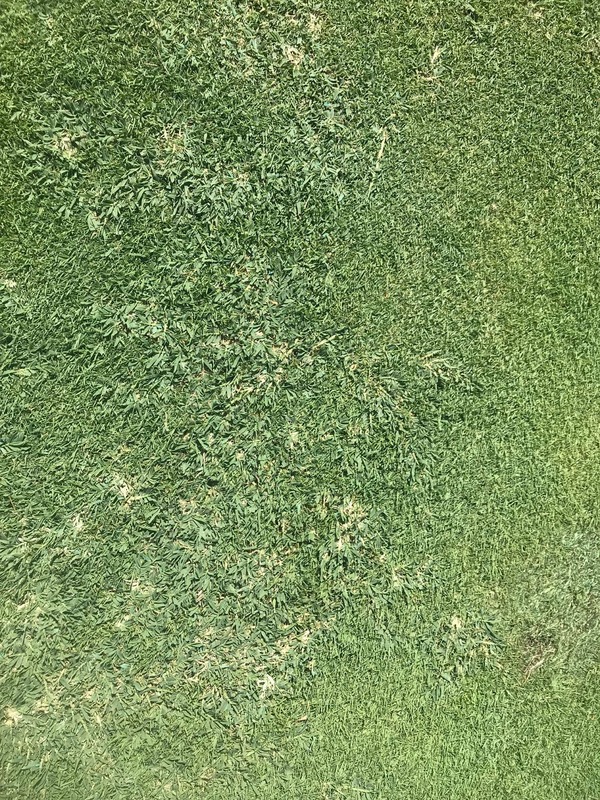 We still must backpack spray areas that have zoysia next to them because the chemical is harmful to zoysia so we will do it very carefully with our small sprayer where bermuda has contaminated the collars next to zoysia. This week the bermuda has turned white if you have been out to the course the past few days. The chemical used (Pylex) disturbs the cartenoid biosynthesis. Carotenoids serve two key roles in plants. They absorb light energy for use in photosynthesis, and they protect chlorophyll from photo damage. By turning white, the chemical is disrupting chlorophyll production in the plant. We are applying this product at 1/2 ounce per acre because it is being applied over the top of bentgrass. It can damage the bent so we are going with lower rates to offset injury to the bent. Standard use rates on more tolerant species are only 1 to 1.5 ounces per acre so as you can see a highly effective product at low dose rates. We must do 3 consecutive applications over about 1 1/2 months to kill the bermuda. Of course, you must then go after the bermuda that is outside the collar so it is an on going process. Collar on 10 turning colors from green to white. Part of the plant is still green. Successive sprays should for the most part kill it. This is a section a few feet away in the approach that was not sprayed. I also sprayed 3 fairways with our fairway eradication product last week. You are beginning to see some changes in fairways 1-3 and a little on 18. The bermuda in these areas will turn a little reddish as the chemical works its way into the plant. I'll have pictures of this over the next few days as the chemical begins to do some damage to the bermuda. I need to spray other fairways but rain and high heat have gotten in the way. I'll probably spray them right before Echofest so it does not disrupt the color until after the event is over. We also must get these sprays completed before the zoyia grass goes dormant which could effect its ability coming out of dormancy next spring. Just completed my 10th full year at Glen Echo Saturday. My how time flies when you are having fun! The transition back to a full-time Superintendent role will be pretty simple except for the fact that I will be getting up a couple hours earlier. Of course over the last two years, my eyes have usually popped open at first light or the old wake up time but I've forced them back closed again and or turned my head away from the clock to try to go back to sleep. Skip, Tom and the rest of the staff have had an excellent year on the course. We are already beginning to transition into preparations for next season. We are seeding some of the mowing equipment damage areas which we will continue to do through the next few weeks. We will be doing some quick slit seeding in areas around greens and high traffic areas. As you can see from the repairs around trees, seed is popping nicely right now with some timely rain and cooler temperatures. 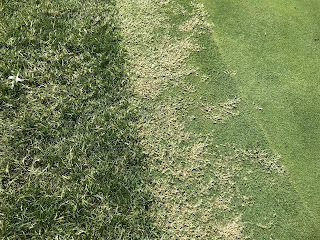 We will also be doing some additional slit seeding of fescue in the rough over the next month before the normal late summer early fall dry conditions set in. Of course this time of year is exciting for us because firm and quick ball roll out are the signatures to September/October at Glen Echo. We will be spraying some bermuda grass on fairways and intermediate to get it going south before fall/winter sets in. 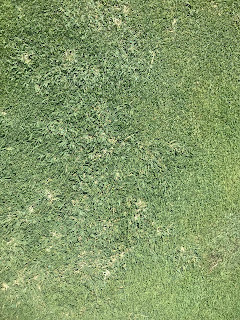 In my travels around the course the last couple of weeks I'm beginning to see a little more bermuda coming back in the fairways so we want to keep it at bay and encourage the zoysia. We will be doing some slicing of our fairways and will be doing some solid tine work in some of our higher population fairy ring areas to improve water and air penetration. 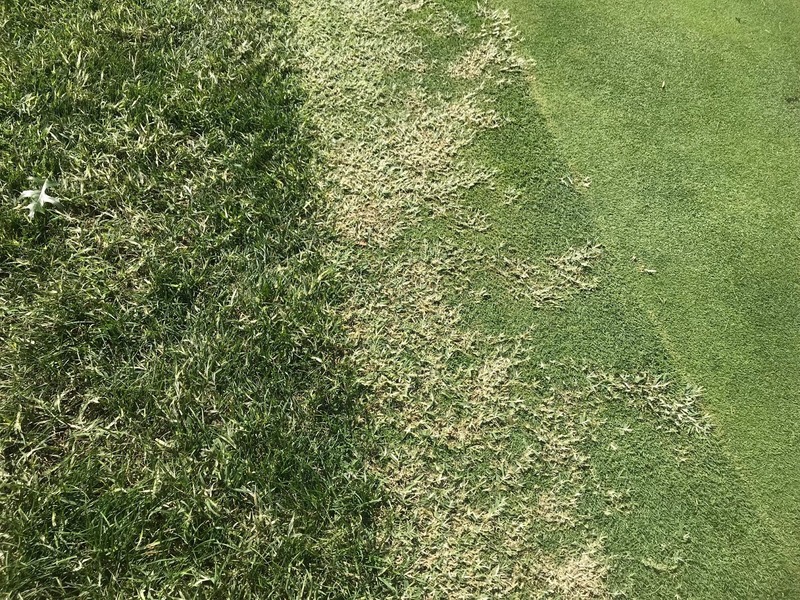 This effort will encourage some thatch reduction which is one cultural practice that could help is minimizing some of the damage from these rings. We will also be going after some collar bermuda around the greens. We will chemical treat the bermuda which will turn it white in color. It takes 2-3 applications every 3 weeks to get this stuff under control. (Of course I don't know if you truly ever get it under control) As we do this work, I will make some blog posts explaining what you are seeing as it is happening. I appreciate what the membership has done for me and my family over the last 10 years. I look forward to assisting the operation anyway I can to provide a quality club experience to our members and guests. Will still see you in the clubhouse for a few more weeks but look forward to seeing you on the course in the future.